The strength of the piano structure is very important to help control tuning stability. Each string (about 230 strings in a piano) has up to 180 pounds of tension. This amounts to approximately 20 tons of tension or the combined weight of 9 (nine) full size automobiles when the piano is in tune. The tension must be supported by the back frame construction (a combination of the metal plate and back posts). The stronger the back frame, the longer the piano will stay in tune. Plate should be what is know as "full cast plate made of gray iron and showing the name of the piano manufacturer cast therein. Finish should be either bronze or silver. 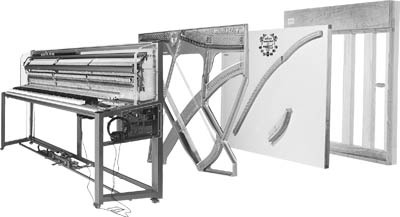 The tension must be supported by the back frame construction (a combination of the metal plate and back posts). The stronger the back frame, the longer the piano will stay in tune. There are many fine European and American pianos that have no back posts at all. This is because they place an emphasis on the strength of an extra heavy I-Beam like plates. Both methods are excellent. 1. A piano is a stringed instrument. 2. Strings are pulled to high tension. 3. The back posts and the cast iron plate work in concert to support the tremendous tension of the strings. * To prevent the back of the piano from warping and twisting. * To enable the piano to stay reliably in tune between tunings. * Without solidity in the structure the many parts of the piano could not function properly. * Size of the post; not only width, but depth. * Post extend to the top of the piano. * Posts extends to the bottom in a tight tenon and mortise constructon. Feel with fingers. * Because its the strongest wood for it's weight. * Resists splitting and cracking. close and dense which provides rigid support. * Posts are bolted to cast iron plate. As mentioned, some pianos will have metal back posts, others, will have virtually no wood back posts at all. Many high quality pianos have scale designs which provide plates that have rigid I - Beam like construction that extend to all four corners of the frame, which actually adds the strength of two or more back posts. This is an expensive process known as a full perimeter plate. This is an acceptable method. 1. The purpose of the pin block is to firmly hold the tuning pins in place where the strings are attached. * Tuning pins vary in quality. * Better grades of tuning pins have machine cut threads. * Tuning pins should be "blued steel", an electronic method to prevent rust. * Nickel-plated steel tuning pin. 2. The pin block in many of the finest pianos in the world consists of several plies of hard rock maple. Alternate plies have grain running at ninety degrees to that of adjoining plies to assure even gripping of the pins, and to prevent splitting of the pin block. * Material of pin block should be hard rock maple. * Wood should be quarter sawn for strength. * Pin block should be at least 2" thick. * Number of plies not as important as type and cut of wood.